Standing majestically on a commanding site in Villiers-street, New Farm, the magnificent new Church of the Holy Spirit was officially opened yesterday by his Excellency the Apostolic Delegate, the Most Rev. Dr. B. Cattaneo, in the presence of a huge gathering. The procession proceeded from Wynberg along Brunswick-street, into Vllliers-street, to the church grounds. 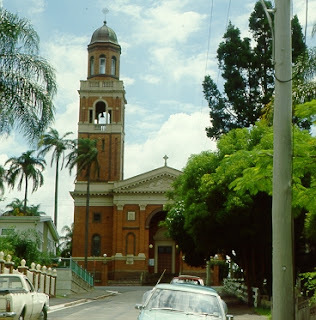 Dr. Cattaneo was attended by Dr. Norman Gilroy and Monsignor Molony, and was preceded by Dr. Duhig, Archbishop of Brisbane, who was attended by Fathers D. O'Keefe and T. O'Connor, and Dr. R. H. Thompson, and Dr. E. Doody. A guard of honour was formed by Members of St. Patrick's branch of the Hibernian Society, and the Children of Mary. Here is a photograph of the church from 1995, featuring its 38 metre tower. The new church was designed in Renaissance style by architect JP Donoghue and built by Concrete Constructions Pty Ltd using Benedict Stone for a cost of around £18,000. Archbishop Duhig engaged sculptor Daphne Mayo to fashion the tympanum (below, bottom) and the Stations of the Cross. Artist William Bustard's ceiling mural for the interior of the church is also photographed (below, top) in a picture from The Catholic Leader. This church was built to abut the rear of Archbishop Duhig's residence Wynberg, allowing an earlier church in the same street to be converted to use as a school. Since 1930 there has been further development in the precinct with the construction of a new school building and a hall. Here is today's photograph of the church.